Brick manufacture – did not develop early in Scotland, where there were ample supplies of stone. However, tiles were worked from medieval times, especially for the decoration of religious houses. By the late 18th century, brickmaking for house building was on the rise, as was an interest in the hand manufacture of earthenware tiles and pipes for field drainage, especially in places where a suitable supply of clay existed. This was the case along the coastline from Portobello to Prestonpans. 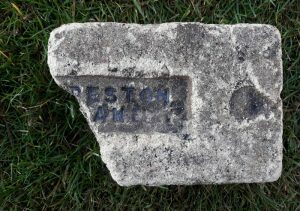 Once waste fireclay and shale (‘blaes’) from coal mining was recognised as having suitable properties for use in pottery and brick manufacture, production was closely linked to the source of these raw materials, as was the case at Prestonpans. 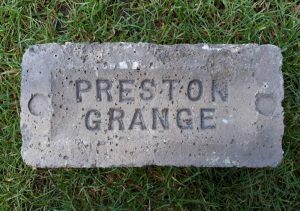 At Prestongrange, an interest in agricultural improvement encouraged the manufacture of field drainage tiles which, in turn, led to the manufacture of heavy ceramics. In 1789, two sites produced tiles and bricks, one near the Old Kirk and another, using clay dug locally, at Ravenscroft. 1723 – 1737 – Reference to papers relating to William Young, merchant in Prestonpans and Christian Hay his relict. Includes accounts for tiles from the brick and tile works and a tack, 17/02/1725, by Alexander Nisbet, Chirurgian, Apothecary, Burgess of Edinburgh, to said William of tile and brick work below old Kirk of Prestonpans for 15 years. 1789 – Two sites produced tiles and bricks, one near the Old Kirk and another, using clay dug locally, at Ravenscroft. 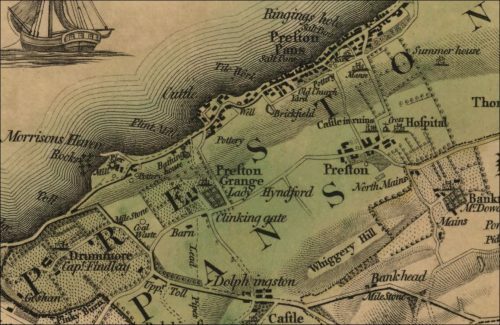 18/06/1789 – Caledonian Mercury – Tyle and Brick Work of Prestonpans. To be let and entered to at Martimas 1790. That complete tyle and brick work in the town of Prestonpans, with kilns, Mill, shades and others apparatus belonging thereto; together with that park or inclosure immediately to the south of said work, known by the name of the Old Kirk or Brickwork Park – all properly inclosed. This work has been under a lease since Martinmas 1769, which expire at the said term of Martimas 1790. There is such a fund of clay within the ground as not only supplies every necessary occasion of tile works, however extensive, but likewise furnishes most of the potteries in the neighbourhood at fixed prices per load. The present tenant is obliged by lease not only to uphold the whole works, with their apparatus during the continuance of the tack, in good condition, and fit for carrying on the different branches of the manufactory, but also to leave them in such good condition or others of equal quantity and quality in their stead at the expiry of the lease. c. 1790 – 1800 – Caddell, Anderson & Co, Old Kirk Pottery and Brickworks also leased Ravenscroft Brickworks from the owner Alexander Banks via his neices, misses Clapperton. 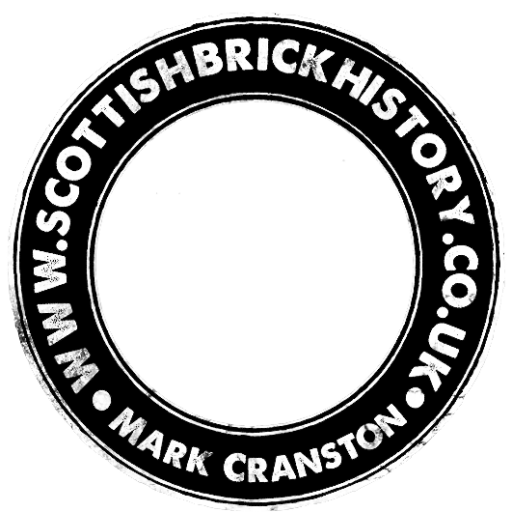 1793 – The main brick and tile works in 1793 was located adjacent to the old kirkyard at Prestonpans. It employed only six men but had thirteen kilns fired that year, each capable of holding 10,000 tiles. The smaller works, (Ravenscroft) which was by the shore nearby, employed only three men and had nine slightly smaller kilns fired that year which contained only 9000 tiles each. Both works used the local fireclay, which according to Trotter was ‘found in great plenty in the neighbourhood’.